The cottage is the original croft house, sympathetically refurbished to create a lovely home from home. Ground floor accommodation includes sitting room, kitchen, bathroom (with over bath shower), utility room, master bedroom (double, with en-suite shower room) and front porch (often called the 'sun-room' by visitors!). Upstairs there are two small bedrooms - one double and one twin. Both rooms have low, sloped ceilings so may not be suitable for taller adults. There is ample storage for clothing & luggage in the passageway between the two rooms. Outside, at the front of the house, is a small patio area with a picnic bench. To one side is a grass area with washing line & this area extends around the back of the property. At the other side is ample parking space. 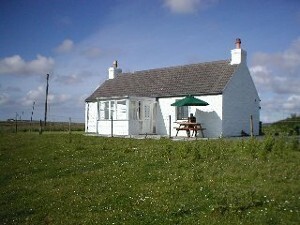 Dogs may be welcome by arrangement but the cottage is in the middle of the croft and the garden area is not enclosed. Livestock, hens and Jill the collie live here, so pets must be well behaved & kept under control at all times.